Conservatives do not like Rousseau. And homeschooling conservatives less so. In fact, a recent book,Apostate, listed him along side other historical figures as a source of apostasy in the West: the grandfather of statist education, bent on destroying the family. Certainly in on sense that may be true: insofar as any and all beliefs not founded upon truth will be harmful. Yet people are more complex than we imagine at times. These are the very words of Rousseau. Does this sound like a hard-boiled statist bent on destroying the family? 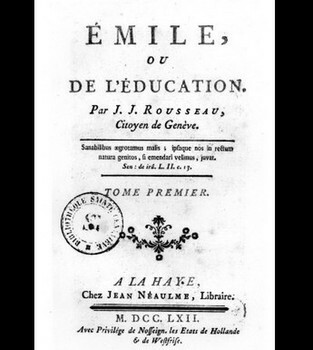 Rousseau wrote some about education in other works, but these quotes come straight out of a book dedicated to the topic of education, Emile (1762). The point of Emile is to offer an idealized educational plan that would minimize social and cultural influences upon the child by cocooning him in a country estate to be raised by his family. Emile was to be homeschooled. But as much as Emile is an idealization, it is also practical. As the previous quote indicates, the scenario Rousseau is setting up includes what he thinks is the typical father of his time: a busy man with little time for his family. A man who pays a private tutor to teach his children. But don’t take my word for it. Rousseauian experts such as Boyd,Terzian and the Stanford Encyclopedia of Philosophy agree. It is understandable how the shadow of today’s statist education casts long upon the historical imagination of many homeschoolers. Rousseau has been made out to be the grandfather of modern statist education when, in many ways, he could be considered the grandfather of modern homeschooling. How? Rousseau’s point in homeschooling was to protect the innocent children from bad social influence. “A young man is led astray in the first place neither by temperament nor by the senses, but by popular opinion. If we were concerned with boys brought up in boarding schools or girls in convents, I would show that this applies even to them; for the first lessons they learn from each other, the only lessons that bear fruit, are those of vice; and it is not nature that corrupts them but example ” [Book IV, emphasis added]. How many homeschoolers believe the same? How many believe that sheltering children is the answer? Naturally, not everyone who homeschools thinks children are morally innocent or that sin only arises from external influences. Yet there seems to be too much Rousseau in too many homeschooling families. And to the extent that such sub-Christian doctrines are believed in homeschooling circles, to that extent apostasy exists. So, by all means, let us understand the history of apostasy in the West but let us not forget how easily apostasy may reside within our own secure borders of home and hearth.